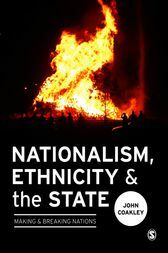 This exciting new book is the first to offer a truly comprehensive account of the vibrant topic of nationalism. Supported by a number of helpful illustrations, tables and diagrams, the text is both engaging and highly informative. Nationalism, Ethnicity and the State: Making and Breaking Nations will prove an insightful read for both undergraduate and postgraduate students and researchers in the area of Politics and International Relations.